Home / News / Mahavirasthan Khudra Vyavasayee Kalyaan Samiti hands over memorandum to the IC of Siliguri police station. Mahavirasthan Khudra Vyavasayee Kalyaan Samiti hands over memorandum to the IC of Siliguri police station. A memorandum has been entrusted to the IC of Siliguri police station on behalf of the Mahavirasthan Khudra Vyavasayee Kalyaan Samiti. Due to the conflict held last Saturday in the Mahavirastan area, businessmen are now terrorized. 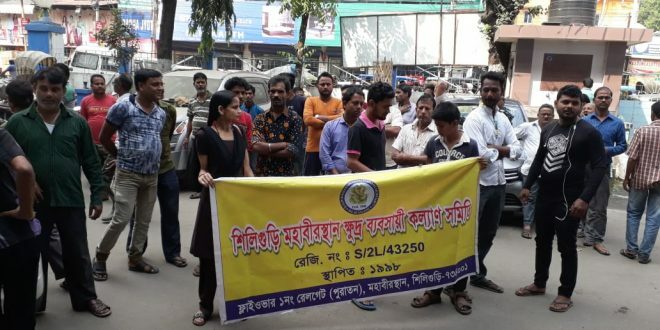 For this reason, the said memorandum has been assigned to the IC of Siliguri police station today in connection with making arrangements for police picketing in the area as well as demanding severe punishment for the culprits. The treasurer of Mahavirasthan Khudra Vyavasayee Kalyaan Samiti, Siliguri, Biplav Ghosh said that after the incident last Saturday, they are very much in panic. That is why they have given a memorandum to the IC in order to arrange police picketing in the area.